March 25, 2016. One last post about Turkey, I promise. 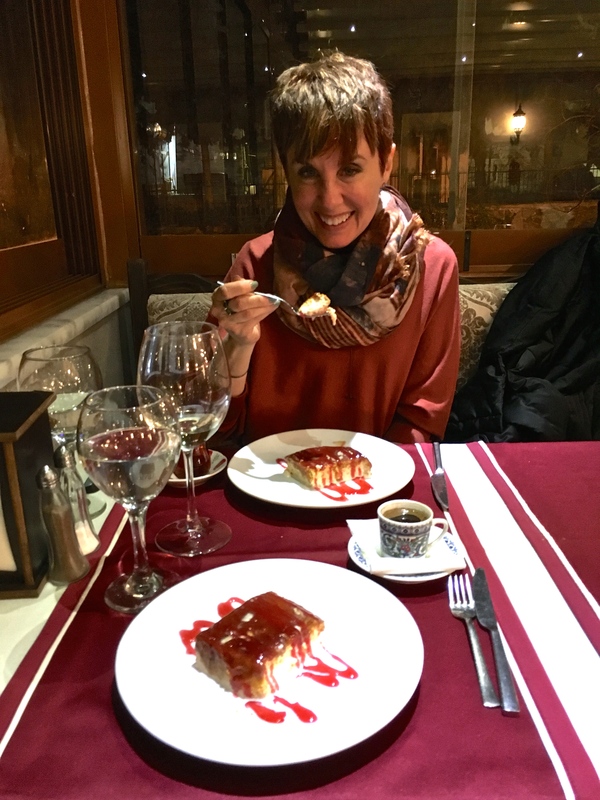 I couldn’t leave the topic without touching on some of the quintessentially Turkish experiences everyone always asks about: whirling Dervishes, baklava, hookahs, coffee, and other such stereotypical stuff. Yep, these items may have been branded as “touristy,” but I’m never one to turn up my nose at anything harmless that has become part of a cultural identity. If it’s fun or delicious, I’ll jump in with both feet. 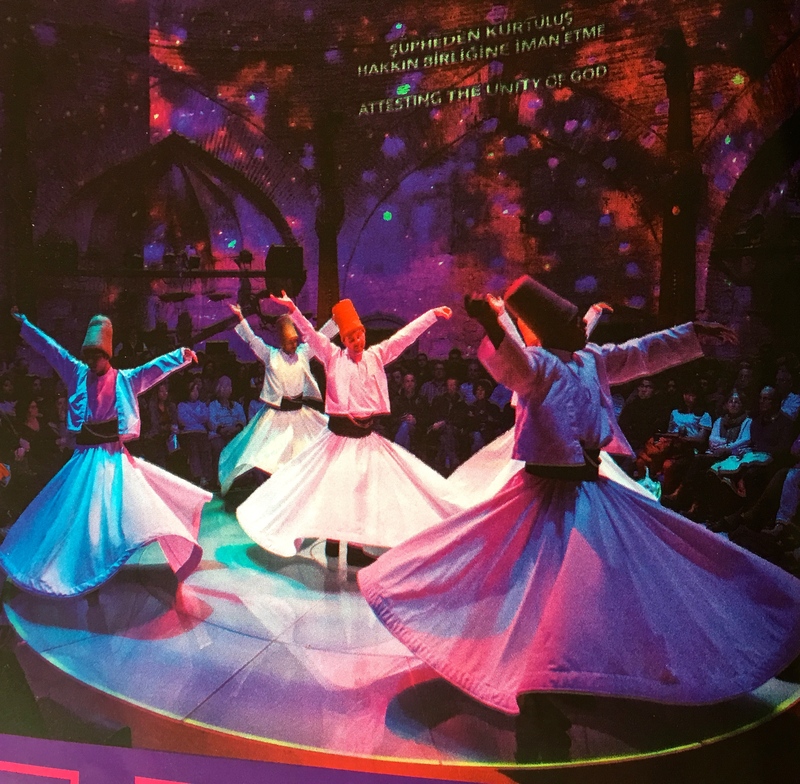 Which brings me to Subject #1: dancing Dervishes…. 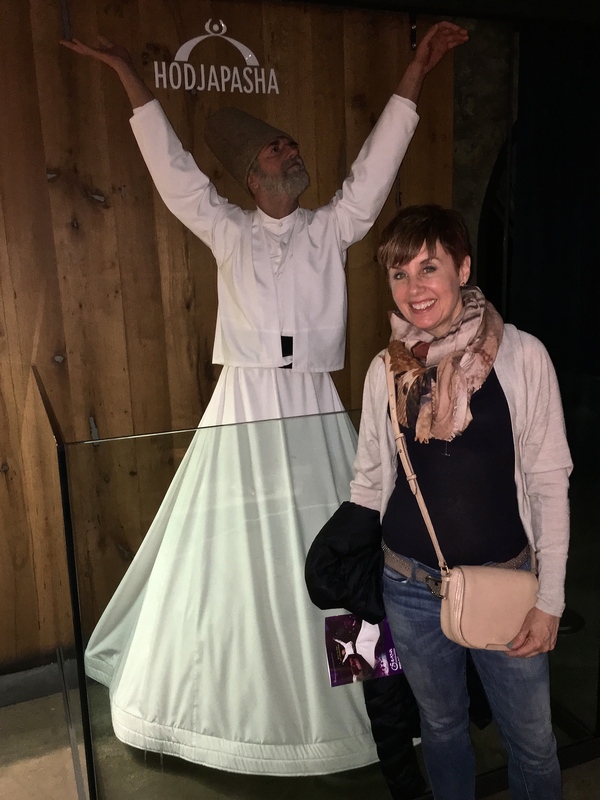 Matthew and I consulted our usual travel guru (Rick Steves) for advice on the best places to catch a traditional Dervish ceremony. Sadly, his two recommendations for authenticity — one being an actual Dervish monastery and the other being a religious foundation — weren’t hosting public events the week of our visit, so we settled on the more touristy Hodjapasha show. No photos are allowed during the Dervish religious performance, so tourists have to make do with this Madam Tussaud-like replica. As the Hodjapasha brochure describes, the Dervish ceremony”is a means for humans to reach Divine Reality and an intoxication of the soul.” Remember, intoxication in any other form (alcohol, drugs) is forbidden in Islam. For those of you who’ve never heard of the Dervish philosophy, here’s my basic primer: It’s a mystical branch of the Sufi Islamic order developed in the 13th century by Mevlana (“Master”) Rumi. Devotees whirl in prescribed patterns as a form of meditation designed to help them relinquish negative human emotions and dependency upon the material world. The goal is to transcend earthly cares and become one with the universe and its Creator. Volunteers still recreate Shaker customs and dances today at Pleasant Hill. Notice how the position of this dancer’s hands resembles that of Dervishes. 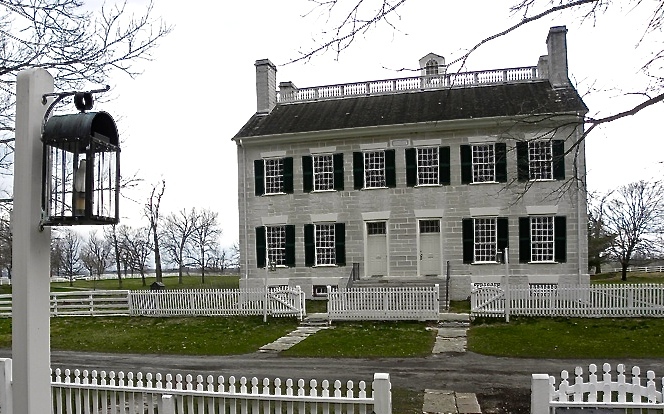 Photo from Shaker Village website. Sorry for the digression; I just find it so fascinating that completely different cultures have come to such similar (and frankly, unusual) resolutions on how to rise above mortal worries. I myself, having once attempted to master pirouetting in ballet and flamenco, can see how twirling unceasingly for an hour or more would literally send your mind spinning off into another plane — and your stomach off towards the nearest toilet. Traditional Turkish instruments include the Kudum (drum), Ney (flute), and Kanun (zither — a version of this instrument can also be struck like a hammer dulcimer.) The mesmerizing, rhythmic music helps create a trancelike state in practitioners of Mevlevi Sufism. Dervishes begin the performance wearing hats called “sikke” that represent tombstones and black coats called “hirka” that symbolize the tomb. 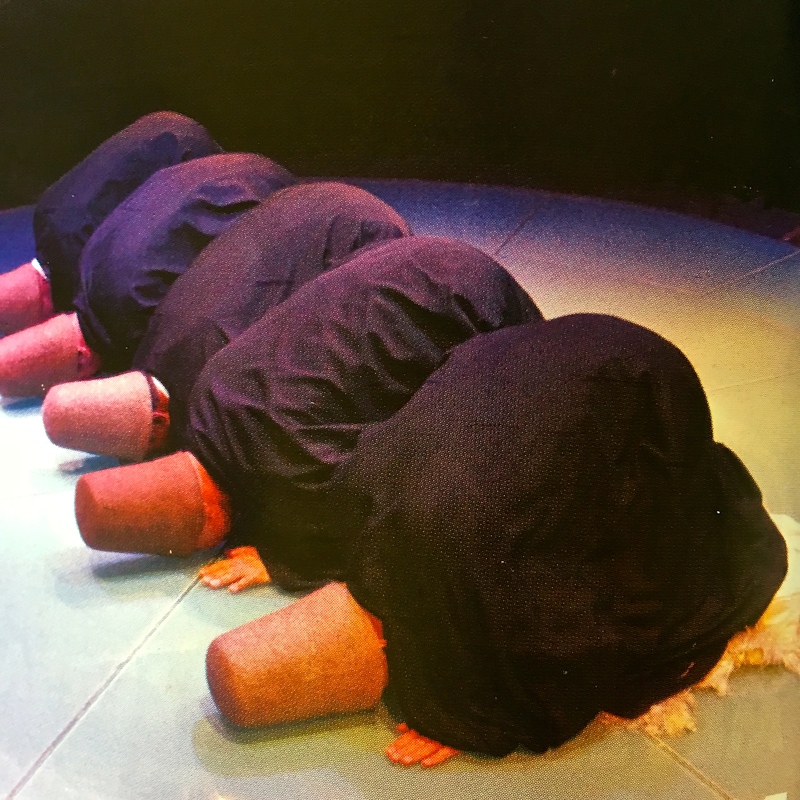 The Dervishes prostrate themselves, pleading for the death of their human egos. Photo from Hodjapasha brochure. The practitioners enter the Semahane (worship circle) wearing black capes and tall felt hats that look like Islamic tombstones. All are meant to represent the death of earthly attachments. But midway through the ceremony, devotees drop the robes to reveal white dresses — “shrouds” that embody the purification and enlightenment gained during their trancelike state. The Dervishes then continue spinning with one hand raised upwards to receive the Creator’s blessings, while the other hand stretches downwards to spread these blessings over the earth. The Dervishes revolve three times at the beginning of the ceremony. The first revolution symbolizes the creation of the sun, moon, and stars and all non-living things. The second tells of the creation of plants and animals, while the third announces the birth of humankind. I always find it interesting to see how many creation mythologies closely resemble the actual evolutionary path. Photo from Hodjapasha brochure. If you look closely at the upper left corner of this photo, you’ll see the sheikh who presides over the Sema. He stands on a red sheepskin that symbolizes the birth and existence of humanity. Together, the sheikh and sheepskin act as a spiritual “lightning rod,” channeling the essence of the Creator. Note that Dervishes turn with one hand up to Allah, and the other down towards Earth, keeping none of the Creator’s blessing for themselves. A Dervish is meant merely to act as the conduit for Allah’s love. Photo from Hodjapasha website. 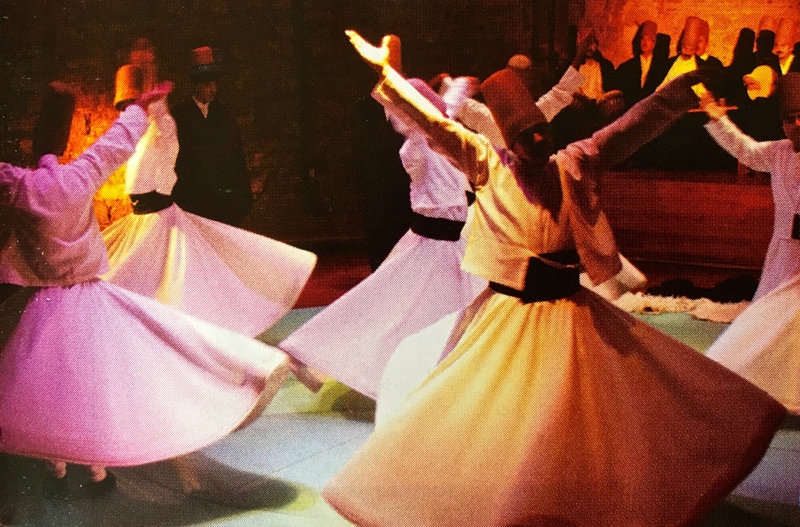 As part of the cycle involving the “birth of humankind,” the Dervishes remove their emblems of death and begin to rotate on their own axis, spinning only on their left foot. They also revolve around the sheikh in the center of the circle. The circular pattern mimics the orbit of the planets around the sun; the motion of electrons, neutrons, and protons around the nucleus of the atom; and the circulation of blood cells back to the heart. Photo from Hodjapasha brochure. Note the rather psychedelic background projected onto the walls, along with a verse from the Qu’ran. At first, I found the AV a bit distracting, but later, I was thankful to have something else to concentrate on rather than the dizzying dance. (Both Matthew and I felt a bit motion sick by the end of the performance.) Photo from Hodjapasha brochure. Watching the service, I wasn’t sure at first if I was witnessing actual believers in action or just well-trained performers. But one elderly man in particular convinced us all that he took the spiritual significance of the ceremony seriously. His expression grew more fervent and joyful, even as his breathing and sweating intensified to the point that everyone worried he might stroke out. When the dance finally came to a close, the audience collectively heaved a sigh of relief for him and wiped the perspiration from our own brows. 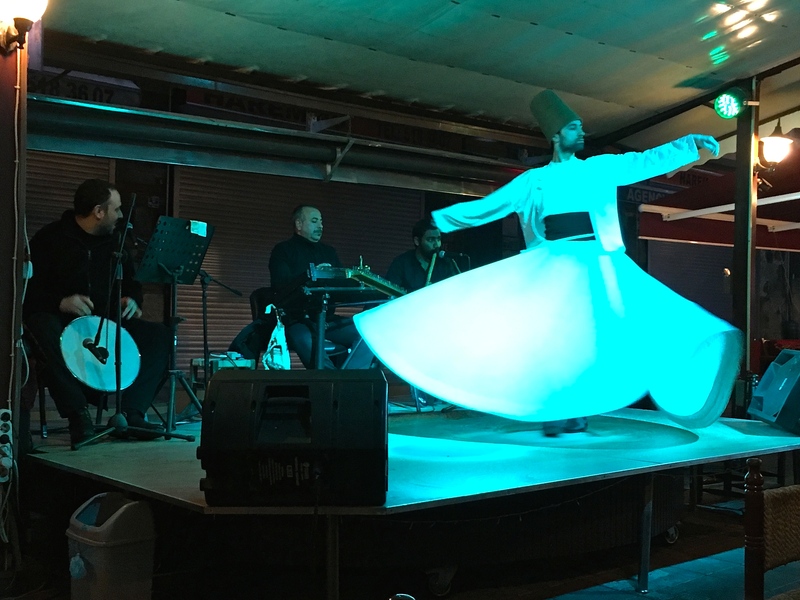 Cafe Meşale featured a fabulous traditional Turkish group, along with a single whirling Dervish — photos allowed! We had one more chance to catch a Dervish dance at Cafe Meşale, a late-night hookah bar near our hotel. 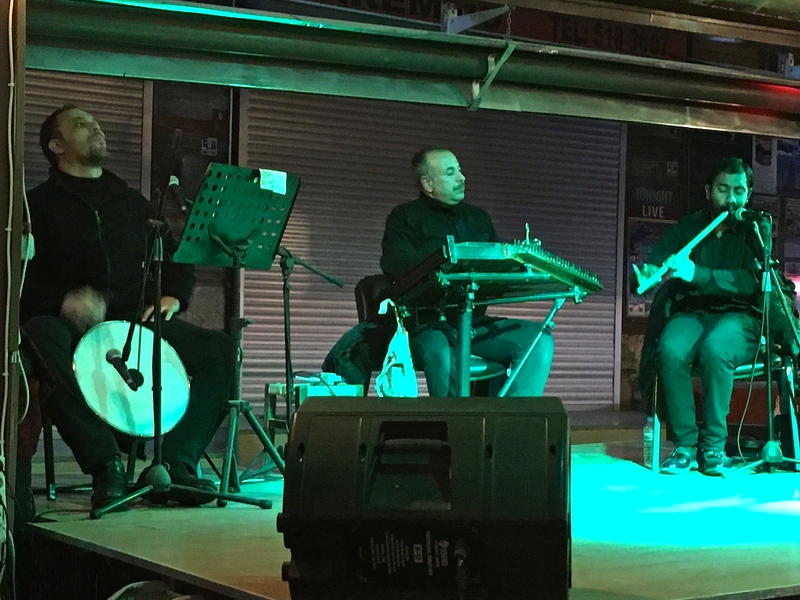 With its traditional Turkish music, performed live by a small band, the outdoor facility lured us in on our last night in Istanbul. We plunked ourselves down on a low banquette, the only non-Turks in the place, while everyone stared at us, probably surprised to see tourists so soon after the Iştiklal attack. Matthew takes a drag from our Nargileh. 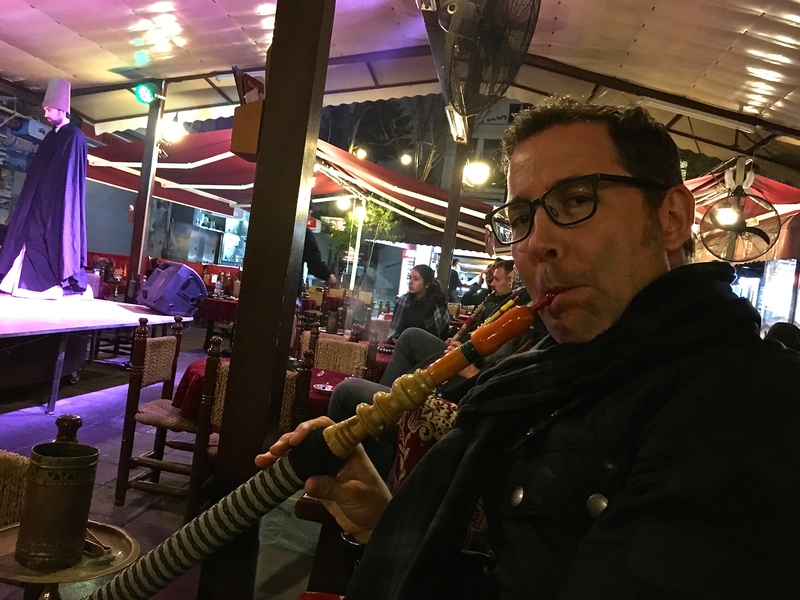 We promptly decided to join the locals by ordering up a nargileh, a traditional “hookah.” For those of you who think it’s nothing more than a glorified hashish bong, the nargileh is actually a fancy pipe for smoking low-level tobacco. The stuff gets mixed in a fruit-flavored jelly that is heated over wooden coals. Folks typically don’t get much of a nicotine buzz because the smoke is filtered through water before being sucked up the pipe itself. 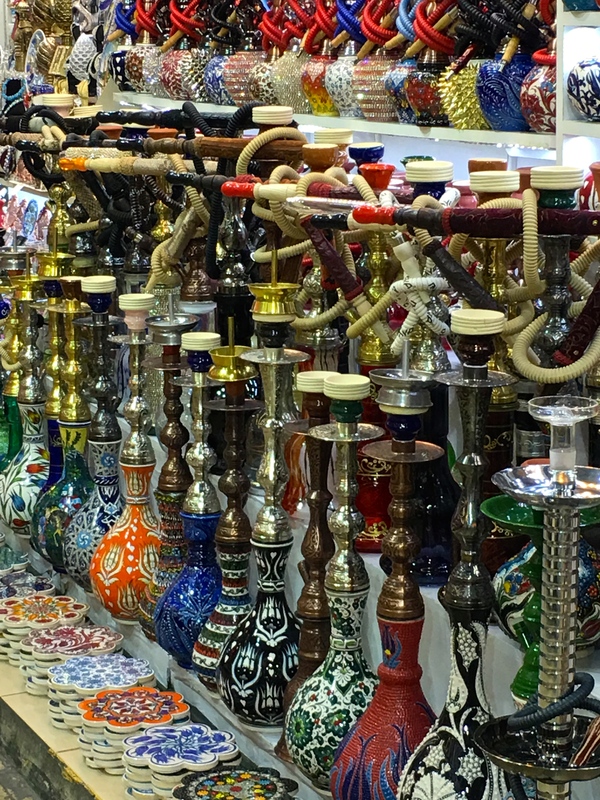 Hookah are a permanent fixture in any tourist shop. But they’re an authentic part of Near and Middle Eastern social customs, having originally been invented by the Persians and later spread to other nearby cultures. Sharing a communal hookah isn’t a touristy thing or hipster trend like it is in the U.S. — it’s a common cultural custom at pretty much every social gathering all across Greece, Turkey, and in many other Near and Middle Eastern countries. (For those of you who have OCD issues like me, each user gets his or her own mouthpiece to prevent the spreading of germs — hookah smoking is a unisex custom, by the way.) We have our own hookah back home, a 40th birthday gift for Matthew from our Greek friends, and the pipes are regular fixtures at their Greek barbecues. That night at Cafe Meşale, we’d chosen a rose-scented jelly, but the couple seated next to us had selected a more hard-core product laced heavily with tobacco. As we sat chatting with them, I watched the girlfriend’s face grow greener and greener. Fifteen minutes into the pipe, she jumped up from the table and raced towards the bathroom. Her boyfriend took off after her, and about ten minutes later, they returned. She shakily wiped a wet towel over her face as he explained, “she’s not used to the strong stuff, and on an empty stomach, it can be too much.” Good to know. 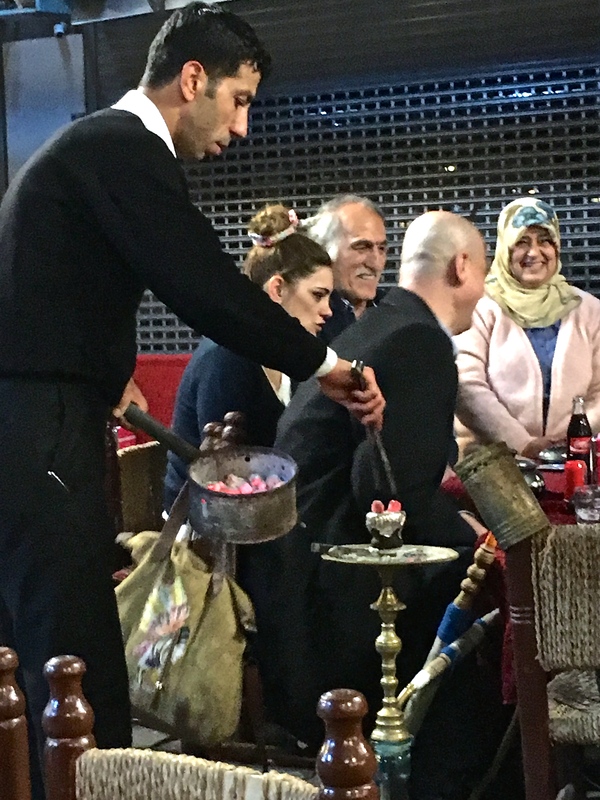 The waiter refills the neighboring table’s hookah with fresh wood coals. The family in the background is the one that shared their birthday cake with us. At this point, the band broke out into a Turkish version of Happy Birthday as a waiter brought an enormous cake to the table across from us, where four generations of a family sat clustered. Everyone at the restaurant clapped and cheered while the birthday girl blew out her candles. And of course, we joined in, with Matthew contributing his traditional ear-splitting whistle typically reserved for hailing cabs. The family laughed and waved to us, but a few minutes later, we were surprised to find the waiter delivering a piece of cake to our table. We looked across at the birthday group, and in unison they performed the traditional Islamic thank-you that consists of a hand-over-heart bow with downcast eyes. Touched, we reciprocated the gesture, and everyone grinned at one another, grateful for this small cross-cultural exchange. People joke about the thickness of Turkish coffee, but you’re only supposed to drink the thimbleful of liquid at the top, leaving the inch of grounds at the bottom of the cup. I’m enjoying Turkish rice pudding with my coffee, by the way. The cake itself was a masterpiece of chocolate, strawberries, cream, and icing, which we washed down with cups of hot Turkish tea and coffee. The first tastes like strong English gunpowder tea, best sweetened by the plink plink of two sugar cubes. The second has a strong espresso flavor that can knock your socks off and keep you up all night, especially if you’re unwise enough to sip past the frothy layer on top and into the sludge at the bottom of the cup. Which brings me to the topic of Turkish food. You’ll find unbelievable meals for incredibly low prices at every corner-side cafe and lunch counter — no need to splurge unless you want to pay for an upscale atmosphere. One thing to note, though: it’s virtually impossible to separate the cuisine of Turkey from that of Greece. (This comment might upset some of my Greek buddies, but I’m not engaging in an origins-story battle; I’m merely observing the similarities between flavors and ingredients.) Lamb, organ meat, peppers, zucchini, squash, tomatoes, okra, and eggplants are staples, all typically saturated with mass quantities of olive oil, yogurt, and herbs like oregano, thyme, and basil. 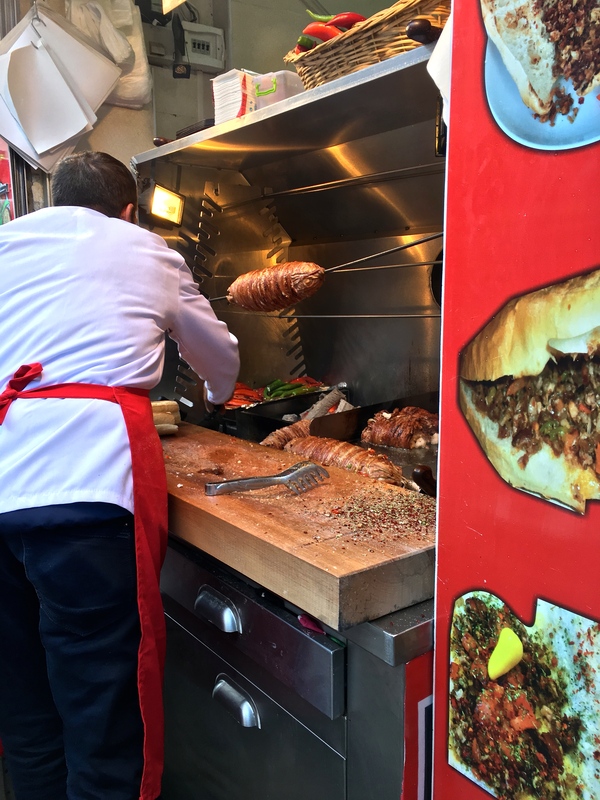 Pictured is the gentleman selling delicious sandwiches featuring kokoreç (lamb intestines). About the only standout Turkish star typically not found in Greek cooking is the tangy, lemony sumac spice that I associate more with Middle Eastern food. On our last day in Istanbul, we had the opportunity to try traditional kokoreç — a sandwich made with chopped-up lamb intestines seasoned with peppers and sumac. This we acquired from a street vendor, who grilled up each portion fresh for the long line of lunchtime locals that had gathered. Honestly, it was fabulous! Not gamey or fatty as I’d expected, but light and flavorful. Our final goal before our flight home was to collect a sampling of the incredible sweets found in the confectioners’ stalls that line the streets of Istanbul. Along with baklava, we selected an assorted variety of loukoumia (Turkish Delight) and halva, a grainy, sesame-based paste that Turks typically eat for breakfast. Most everything is sweetened naturally with honey, so we convinced ourselves that we were eating healthfully organic, despite the caloric overload. One window featured a mouthwatering display of puddings and cream-filled pastries. A woman rolls out dough for “gozleme,” a type of flatbread cooked on the convex metal oven nearby her. Nuts preserved in jars of honey compete with a tower of “kadayif,” a dessert made of shredded wheat, nuts, and syrup. A chef prepares a fresh batch of baklava for the lunchtime crowd. More kinds of baklava than you can count. The Ottomans invented sherbet — but not the ice-creamy kind I’m used to from the South. Their sherbet is more of a liquid made of fruit juices and flower nectars, mixed together with sugar and sometimes poured over shaved ice. We sampled every imaginable kind of Turkish Delight (a kind of gelatin flavored with flower essences and nuts). My final comments on Turkey wouldn’t be complete without noting the nation’s vibrant street life. Some might say it’s overwhelming, but I prefer to think of it as invigorating. Men carrying baskets of Turkish pretzels on their head vie for sidewalk space with scooters toting gallons of water and olive oil. Guys pushing dollies loaded with carpets careen through stands of women pedaling nuts, spices, and tube socks. And everyone works to avoid squashing the multitude of homeless cats and dogs that wander the streets. This guy is carrying a load of “simit” (Turkish bagels) to his street cart. Covered with sesame seeds, these treats are a traditional breakfast food. Matthew partakes from one of the Turkish bagel carts. The sidewalks abound with shoeshine men bowing before their ornate brass kits. Check out this Culligan Man. I love this basket-weave jacket for the water cooler at a nearby mosque. The sign says the local pharmacy has provided the water as an act of charity. Charitable care-taking of the poor and needy is one of the five precepts of Islam. A word about our furry friends. At first, I felt depressed by the enormous number of unclaimed critters that roam Istanbul’s alleys. But over time, I began to see how much the community at large takes care of them. Every mutt is tagged, and we saw many posted signs with photos advertising, “Have you seen this dog, with tag #xxxx? We want to adopt him.” Likewise, most every shop and restaurant puts out little beds and baskets for stray cats, as well as bowls of food and water. 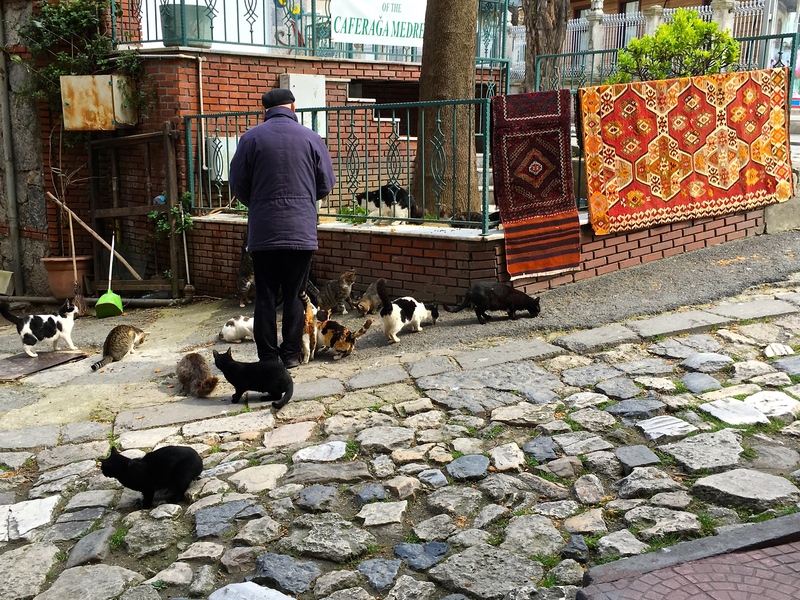 Our hotel manager pointed out this retired policeman, who feeds the local kitties every day and takes all newcomers to be spayed and neutered, which he pays for out-of-pocket. Turns out that feral cats are part of a bigger plan to reduce the rat population in Istanbul — a program that our hometown of Chicago has recently introduced. I’ll also say that I never once saw anyone being cruel to the animals, and I frequently witnessed shopkeepers petting the strays, crooning to them, and offering them fresh tidbits of meat. All of which is just another example of the main theme we encountered during our trip: Turkish hospitality is hard to beat. I hope you all get a chance to experience it just once in your lifetime. But it’s a shame, though; the way things are going with the latest airport attack and failed coup attempt, a visit to Turkey could be a long way off. Check out this badass, who’s riding his bitchin’ hog backwards. Two cuties hanging out at Hagia Sophia.